The first multi-modal terminal in Varanasi aims to boost freight movement through the eco-friendly and cheap inland waterway mode. India’s water transport is gaining a divergent new boost. The government is not only exploiting the country’s water potential optimally but upgrading existing waterways and creating new riverine pathways. With the aim to promote inland waterways as a cheaper and environment-friendly means of transportation, Prime Minister Narendra Modi recently inaugurated India’s first multi-modal terminal in Varanasi by receiving the country’s first container cargo transported on inland waterways from Kolkata. With an estimated Rs 53.69 billion, equally shared between the Government of India and the World Bank, this is the first of four multi-modal terminals being constructed on the National Waterway-1 (River Ganga) as part of the Jal Vikas project of the Inland Waterways Authority of India. The project involves the construction of three multi-modal terminals – in Varanasi, Sahibganj and Haldia – two inter-modal terminals and five roll-on-roll-off (Ro-Ro) terminal pairs. The contract for construction of Phase-I of the multi-modal terminal in Varanasi has been bagged by Afcons Infrastructure. Afcons is the leader in marine construction in India, and, is counted among the top 10 marine companies globally (as per the latest ENR survey). While the terminal in Varanasi reportedly costs Rs 1.69 billion, the second terminal in Sahibhanj, Jharkhand, is expected to be built at Rs 2.80 billion and likely to be ready by June 2019. The third terminal in Haldia will reportedly cost Rs 5.17 billion and is expected to be ready by January 2020. Banked on 1,320 km of National Waterway-1 from Haldia to Varanasi and spread over 43 hectare, the cargo handling capacity of the terminal is 1.26 mtpa. The cargo that will be handled at the terminal includes stone chips, cement, food grains, fertilisers, sugar, etc. The potential of inland waterways to emerge as a viable alternative to road transport is immense in a country where barely 3.5 per cent of trade is done through this route. The country’s first terminal on the River Ganga not only promises to generate employment but save fuel and resources at large. “Owing to the shift of low and medium value cargo to the inland waterways terminal, the project is a big relief to rail and road transport,” says Yoganand M, Project Manager, Afcons Infrastructure. “This way, the railways and roadways will be able to carry high volume and deliver items much faster, thus resulting in increased revenue.” The terminal facilitates a direct greenfield road connecting to NH-2, two mobile harbour cranes capable of lifting 50 tonne at 18-m reach, workers amenities with rest area, dedicated passenger pontoon jetty and terminal administration building. Besides, the project and proposed freight village in Varanasi are expected to generate 500 direct and over 2,000 indirect employment opportunities. The berthing structure of 8,400 sq m has been constructed using new-generation hydraulic piling rigs and vibro-hammers, with the innovative construction method of using pre-fab mattress projecting inside the river for the construction of the pile foundation. With 72 supporting piles of a total length of 52 m, the piles were constructed in two phases – the first involved the construction of pile from the mattress level to the founding level, while the second phase involved the construction from the mattress level to the final top level. 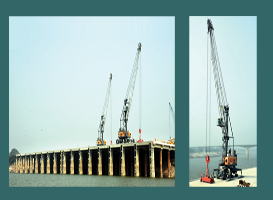 All elements of the superstructure like beams, slabs and fender blocks were precast and erected under floating conditions using modular pontoons and a hydraulic crane of 100-tonne capacity. Also, waterways can have an adverse impact on the ecology of rivers – not every waterway is cheap and a desirable option in terms of ecology. However, to overcome these challenges, “regular environment impact studies were conducted,” Yoganand affirms. Indeed, several safety and environment-friendly measures were undertaken during the execution of the project and after its commissioning. Further, special care was taken to ensure aquatic sustainability and ecology of the river. Besides avoiding direct discharge of any harmful effluents into the Ganga, measures like recycling of construction waste like bentonite fluid was conducted and the debris of construction was collected and disposed in a designated land fill. Contractor: Afcons Infrastructure. Tel: 022-6719 1000.